During Open House season, schools are looking for ways to stand out among the crowd of institutions trying to reach prospective parents. Talking about a school’s “warm and nurturing community” and the “academic excellence” is only going to get the school so far. So what else can schools do to rise above all the noise? When we are faced with many choices, we often rely on word of mouth from friends in our social networks to help make our decisions. So it was clear to us at The Jewish Education Project that in order to promote the school in a unique way, we need to have the parents involved and we need to get the parents talking. As Bonnie Raitt writes and sings, “Let’s give ‘em somethin’ to talk about.” Or in the 21st century version of this, let’s give parents something to Facebook about. Parents who are part of the Parent to Parent (P2P) network have been learning about the power of social media to share their stories about Jewish day school education, and adding their voices through local parenting blogs and the Parent to Parent site. The challenge has been to keep them talking, especially during peak periods, such as open house season. Here’s where the campaign approach comes in. The P2P campaign model organizes parents for a specific time period to talk about a value, an idea, an event – any focus point unique to the school that will help prospective parents get a better idea of what that school, and the community it fosters, is all about. A very creative campaign can promote the school, without necessarily talking about academic excellence or the nurturing environment. 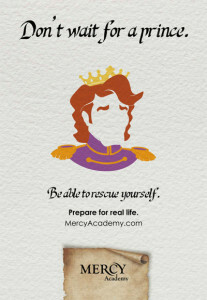 Take for example a marketing campaign for Mercy Academy, an all-girls’ Catholic school in Louisville, Kentucky. In an article about the campaign, the writer explains “The campaign, created by Doe-Anderson, a Louisville-based advertising agency, is meant to reflect one of the school’s core goals: to help its students become independent, productive women in the real world.” And as you can see in the ad, they didn’t need to show science labs or innovative technology to get the message across. Jewish day school education is first and foremost about imparting positive values to our children. You know it when you experience a Jewish day school education. We need to give parents a framework to convey those values with their friends. The highly engaged and motivated parents of Mazel Day School (MDS) of Brooklyn were the brave pioneers who first experimented with this approach. When I asked the parents what they love about the school, most of them had a real, emotional reaction to the question and talked about the school’s successful approach to imparting positive values. They are extremely proud to see their children grown into mensches. 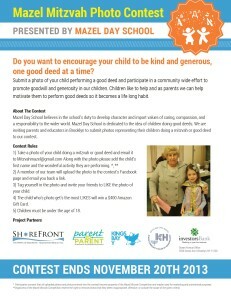 It was no surprise that they suggested a Photo Mitzvah Campaign promoting the value of the children doing good deeds by inviting parents in Brooklyn to submit pictures of their child doing a mitzvah or good deed. The Mazel parents wanted to reach parents from Jewish early childhood centers in the area, so they partnered with several of them on the campaign. 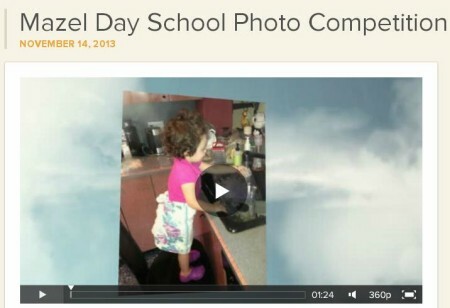 The submitted photos were shared on Mazel Day School Facebook page. The photo with the most “Likes” on Facebook won a $400 Amazon Gift Card. Mazel Day School parents gave out fliers in the early childhood centers, emailed their friends, sent Facebook messages and talked to other families. The parents now had something to talk about. The campaign ran for five weeks and opened new doors for the school to reach prospective parents. For the first time, Mazel Day School officially partnered with early childhood centers in the area: KingsBay Y, JCH of Bensonhurst, and Shorefront Y. These new relationships can now be leveraged for other partnership opportunities and for reaching prospective parents. The campaign increased exposure of the school to the broader community. Mazel Day School Parents overheard parents who were not part of the school talking about the contest. The Mazel Facebook page experienced a significant boost during the competition period, including 50 news likes on the Facebook page. The last time they had so much traffic was when their school was destroyed during Hurricane Sandy; now the attention was due to a positive story that truly highlighted the school and the community. In their reflection about the implementation of the campaign, the Mazel parents wanted to organize a larger group of parents to lead and implement the campaign to reach an even larger audience of prospective parents. At their upcoming open house, the school will ask prospective parents how they found out about the school. At this time, the Mazel parents will be able to evaluate more specifically the reach of their campaign and where they need to focus their future outreach efforts. Invite a minimum of three parents in your school to run a campaign. The parents should identify a value, event, or other unique aspect of the school that excites them and would be appealing prospective parents. If it doesn’t galvanize your current parent body, don’t do it, because they won’t be talking about it with their friends. Identify your target audience; be very specific on who you want to reach with the campaign. Mazel parents aimed specifically for parents of children in local early childhood programs, for instance. Get talking! Play around with different social media tools to spread the word about the campaign. Empower parents with the tools they need to keep the conversation rolling. Most importantly, make it fun! Turn it into a competition, make it into a game. Let the parents get really creative and make it their own. Best-selling author Seth Godin writes: “Stories are the way we navigate our world, our chance to make sense of who we are and what we do. […] Nonprofits make change, and the way they do this is by letting us tell ourselves stories that nurture our best selves.” Creating a buzz and chatter around your school requires giving parents a great story to talk about. Day school parents are part of a movement committed to giving their children the greatest Jewish education possible. Let’s build that movement; let’s help parents get their stories out. What will your community share? Parent to Parent is an initiative of The Jewish Education Project and is made possible by a grant from UJA-Federation of NY. Learn more about Parent to Parent on our website, blog, Facebook and follow us on Twitter. If you are a New York area day school and would like to get staff assistance to implement this project, contact Irene Lehrer Sandalow, Project Manager in the Day School Department of The Jewish Education Project at isandalow@jewishedproject.org. Last week, participants in the Detroit Social Media Academy learned about content generation and curation, a topic at the heart of any effective social media strategy. Above are the slides, and below are some important take-aways for thinking about your own content… Take a peek and let us know what you're up to when it comes to content creation and curation! Content is a connecting force. Think about the classic Jewish study model of chevruta: two people hover over a text, dissecting it, questioning it, comparing it to other sources and their own lives. In the process, they not only develop a deeper relationship with that text and Jewish tradition, but with one another. The text is the connector. That's what good content can do online, in a way that's broader, public, and potentially more inclusive. Always start with your goals. You have to know what you're trying to accomplish in order to choose the right content – and, by extension, the kinds of conversations – that will help you and your community get there. Always remember your audience. The people you are trying to reach have their own self-interest, for better or for worse. Practice empathy. If you can tease out the sweet spot, the overlap between what you want to accomplish and what they want for themselves, you'll be able to choose, develop, and share content that's both meaningful to your audience and relevant to your goals. Events as opportunities for content generation. Pictures, videos, and quotes are all quick, easy things you can grab at an event and make effective content. Think through what else might work for your event, who will be responsible for capturing it, and how you can share it. Crowdsourcing for content generation. It's important to be transparent about your intentions, but putting a question or enticing message out on social media, then using the responses as a blog post or as another type of content (collect images or links, turn the responses into a graphic, etc. ), is a great way to build community and momentum online AND generate meaningful content. Blog parties for content creation. Some communities are experimenting with hosting IRL (in real life) parties specifically geared towards sharing and documenting stories. Again, you need to be transparent about your intentions, but getting together a small group (and a few laptops) for some wine, cheese, and storytelling can make for a fun opportunity to both build community on the ground and unearth great stories to share. Have evergreen/recipe content ready to share anytime. Much of the content we share is event or time specific; but having content that's appropriate anytime is a useful way to keep at the front of your audience's mind more often. That way, when you ask them to attend an event or give a donation, it's not coming out of the blue – they've already been in conversation with you and are ready to listen. Lists, recommendations, interviews, profiles, etc., can all be great options, but think about what might work for your community. Reframe what you're already doing. Be conscious about what you're sharing (get permission for photos, etc. ), but anytime you can capitalize on the things you're already doing, or capture moments in real time (think mobile! ), you're putting together an authentic experience for your audience and building trust. Content curation. A curator is a sense-maker. She's someone who knows what's out there, finds the best of it (again, based on her goals and her community), and puts it together in a way that makes a meaningful experience. This means sharing your voice, explaining key points, asking good questions, being attentive to the responses. It means being very aware of what's available and what might be useful to your community. Finding, framing, and sharing other people's content in a way that speaks to who you are and what your community wants is the real opportunity behind content curation. It's a fun, though sometimes challenging, way to build your reputation online. Curation begins with listening. Listen for good content shared by others. Listen to your community. Listen for responses and be ready and willing to shift and reset if something isn't working. Next steps? Time to try something new! Listen, plan, and jump in and have fun! How do you create and find great content to share with your community? What else would you like to know about content generation and curation? All this talk about ‘developing a network’ and ‘organizational change for the connected age’ can feel both daunting and vague. But really, it’s just like starting a band! (And you’ve always wanted to be a rock star, right?) Here’s how it works in five easy steps. If you don’t already have a band/network, what kind do you want to start? Ah, the all-important question of purpose; the question we so often avoid (or forget, or ignore). Whether you’re starting a band or a network, you’ve gotta know why. For a band, the goal may be to have the equivalent of a Saturday night poker club, or it may be to spread a particular message, or it may be to hit the Top 40 and win a Grammy or two. Whatever it is, the whole band has got to be on the same page in order to meet that goal. For a network, what is the change you are trying to make in the world? It may be to push through a particular piece of legislation, to revitalize a neighborhood, or to overhaul an entire educational system. The answer to this question – ultimately a question of your communal DNA – will have bearing on all the other questions you’ll need to ask yourself moving forward. Look at your community; how would you define your communal DNA? What instruments/skills do you need to make the music? Who do you already have, and who do you need? (And does everyone know their role?) To answer this question, it’s important to reference tried-and-true templates, but also to think outside the box and be open to serendipity. A rock band may typically be drums, guitar, bass, and vocals, but magic can happen when you throw in an electric violin or, dare I say it, an accordion. A network focused on housing issues needs governmental connections, lawyers, activists…but what happens when you engage those benefiting from the work of the organization? Or schools? Or artists? You may also want to ask what other skills folks bring to the table. It’s exciting – and useful – when you find out the saxophonist is also a graphic designer, or the artist in your network has a background in urban planning. What ‘instruments’ are already making music in your community? How are the musicians/members going to work together? The logistical bit. Basically, what does band practice look like? How formal are your gatherings? What kind of space, physical and/or virtual, do you need? How often will you meet? Does everyone read sheet music or do you need to pair people up to teach one another the tunes? And, of course, how will performances (if you perform at all) be arranged? The same is true for networks. Some are like closeted chamber choirs who work diligently at their craft but are rarely seen in public, while others are punk bands who use gigs as rehearsal time. This is also the place to consider folks’ other obligations. Is the drummer the only one in town who can keep time and is playing weddings with other groups every weekend? If so, what does that mean for the band? Are there other organizational affiliations or time constraints among the members of your network you need to consider? What are your community’s priorities, and where is the overlap with your goals? How can other priorities be a challenge, and how are they an advantage? What other connections do you need in order to be successful? A danger in both bands and networks is that the core becomes too tight. The group only looks inward and becomes an echo chamber. This often doesn’t make for good (or, at least, popular) music because it doesn't produce what the audience really wants to hear, and never makes for a healthy network. Therefore, it’s important to develop what I call peripheral vision; the ability to see the edges of your network and bring in new ideas. Who’s at the edge of your network, and what role can they play? Or put another way, of the things you need, how much of that can you get from your close connections in your current network/band, and how much do you need to look for elsewhere (build new connections)? For a band, it might be fans, venues, other musicians, or social media marketers. For a network, these folks might be network strategists, thinkers in parallel fields, like-minded groups in other geographical areas, or folks from other faith traditions, ethnic backgrounds, or age cohorts. Take a peek out of the corner of your eye; who’s in your peripheral vision who can help your community make real change? Is it working? As always, ya gotta go back to your goal! Are you accomplishing what you set out to do? In order to know that, you have to think about how you can measure your success. As with all measurement, there are quantitative and qualitative approaches, and both are necessary. The quantitative element may have to do with how many people are hearing the music, or coming to shows, or whether people are sharing it with their friends, or which songs are getting the most airplay, etc. Qualitatively speaking, you want to think about other things. Does the music sound good, does it feel good? Are the personalities meshing and the communal DNA evolving? Are you making people dance? Is your song getting stuck in people’s heads? It’s the same with networks. Take a balcony view of the folks in your group. Are the right connections in place to make great things happen? Where can you leverage existing connections, and where can you work on building new ones? And, perhaps most importantly, who can help you make it even better?! No network weaver is an island, after all. How do you measure the health and effectiveness of your community? Regardless of whether you’re starting a community of practice for Jewish educators or the next great 80’s tribute band, these are a few crucial questions that will help make the whole enterprise sing. What are the other key ingredients? What else has made your network (or band!) successful? Many thanks to my bandmate and husband, Alan Sufrin, for being awesome and helping me think through this post. Jewish Values and Social Media – Meta Converastion! Posted on December 11, 2013 by Author Lisa Colton Leave a comment on Jewish Values and Social Media – Meta Converastion! This is cross-posted from Miriam Brosseau’s "Clips and Phrases" Tumbler. Here’s the current state of a conversation about social media and Jewish values happening on my Facebook profile. What would you add? Ok, everybody – favorite Jewish values and/or texts that could potentially relate to social media. And…go! Irene Lehrer Sandalow Al Tifrosh Min Hatsibur. Social Media makes sure stay you connected to your community. Miriam Brosseau Whoah, Elizabeth and Irene, you are totally on the same wavelength… and it’s a great call, thanks! Sara Shapiro-Plevan I’d say that “im ein ani li, mi li” and the rest of that mishna speaks beautifully to the fact that we are nodes in a larger network and not just in relationship with ourselves. Also, Pirke Avot ch. 6 talks about drawing close to colleagues and students, not separating one’s self from community, knowing and contributing to the knowledge of others, and sharpening others’ knowledge as well. Carrie Bornstein Sara – you JUST beat me to it! Anita Salzman Silvert I would add the whole Lashon Ha-rah issue. Just using some of the text in a little presentation on the jewish values found in “The Music Man” …think pick a little talk a little…! Carrie Bornstein Eizeh hu chacham? HaLomed miKol Adam. Who is wise? The one who learns from all others. Naomi Malka Da Lifnei Mi Ata Omed—be mindful of your values wherever you go and whatever you say in cyberspace. Yehudit Batya Shrager The essence of tsniut is being independent of the good opinion of other people. (For the DL on tsniut read “Outside/Inside” by Gila Manolson.) In other words, know what to share and what to keep to yourself and do not define yourself based on how many “friends/followers” you have or how many people “like,” your status updates. Arnie Samlan What about the whole concept of a minyan? That there is a tipping point at which enough human-social energy gathers. Lisa Narodick Colton Wow, this is great. I’ll add tzimtzum — needing to contract oneself to make room for others to create. good for community guidelines — don’t be a conversation hog. Larry Brown Excellent topic, Miriam! I believe Pirkei Avot says to find a Rabbi/Teacher and sit at his feet and study. The whole concept of the Oral Torah is that one cannot truly understand Torah simply by reading text, one must learn from others. That is why our ancestors were so reluctant to write it down. Interactive social media can be seen as another way of learning from others. Paul Wieder Pirsumei Nisah— from Chanukah. Want everyone to know about a miracle? Put it in the window! Arba Kanfot— the idea that, while Jews are spread to the “four corners” of the world, we are united. “A father who does not teach his son a trade teaches him to steal.”— We are required to teach as well as learn, to pass on our knowledge. Stanley Mieses Kol Yisroel and Derech Eretz. There is no them….only us. Geoffrey Mitelman I’d add that in our ever-more-interconnected world, g’milut chasadim and tikkun olam are becoming more and more synonymous. Guest post from Rabbi Aaron Spiegel. This post is part of a series on networks and network weaving. Synagogue 3000 just released a report entitled “Reform and Conservative Congregations: Different Strengths, Different Challenges.” The report could just as easily been entitled something like “Synagogues are Fading Into Obscurity,” but that would be a little too provocative. The data is clear; the institution best positioned to provide the full richness of Jewish life is becoming irrelevant for most American Jews. More disturbing is that our research shows some 70% of young Jewish adults, those between the ages of 23 and 39, have no connection to the established Jewish community (synagogues, Federation, JCC’s, etc.). While many in the Jewish world talk about Jewish continuity and protecting the future of American Judaism, most of the proposed solutions have had little effect. The good news is we’ve also learned that this majority of young Jews are very interested in Judaism, just not the way we’re offering it. While most in the congregational world talk about outreach, Synagogue 3000 learned that this moniker has a negative connotation. Outreach says, albeit subtly, “I’m reaching out to you so you can come to me and have what I want to offer you.” The community, particularly those young, single Jews who are our potential future are saying, “no thanks.” Instead of outreach Synagogue 3000 changed the conversation to engagement. Learning from the church world and community organizing, Synagogue 3000 created Next Dor (dor is Hebrew for generation) – an engagement program. Participating synagogues agree to dedicate a staffer, most often a rabbi, whose primary job is to meet young Jews where they are – physically, spiritually, and emotionally. These engagement workers are charged with finding young Jews, be they in bars, coffee houses, local gyms, etc., and finding ways of engaging them in conversation to create relationships. Relationships create trust, which creates other relationships, which creates opportunity for real engaging conversations about life and what Judaism has to offer. One of the key points is that this engagement and these relationships are l’shma, for their own sake. Synagogue membership is not the goal – connecting Jews to Judaism is. While the goal is engaging young Jews in Judaism, several of the Next Dor partner synagogues are discovering tangible benefits. Next Dor D.C., a project of Temple Micah was one of the first adopters. Rabbi Danny Zemel, a proponent of this engagement model before Next Dor existed, knew that Temple Micah needed to engage this unaffiliated and disaffected population. As a Next Dor pilot synagogue, Temple Micah hired Rabbi Esther Lederman as their engagement worker. A big part of Esther’s job is having one-on-one meetings with young Jews, usually in coffee shops. Now in its fourth year, Next Dor D.C. has gone from one-on-one meetings to regular Shabbat dinners at Esther’s home to annual free High Holy Day services for young adults, led by Esther and Michelle Citrin. The results – young Jewish adults are joining Temple Micah. Some have dubbed this approach “relational Judaism” which seems something of an oxymoron. Judaism is at its essence (at least in my opinion) all about relationships. Unfortunately, congregations have focused on other things like supporting infrastructure, b’nai mitzvah training, and programming. More than the first two, the focus on programming is the irrelevance linchpin. Rather than engaging Jews in what’s important in their lives, synagogues program based on anecdotal information. When numbers fall the default synagogue response is to seek better programming rather than forming relationships with members, finding out what’s really important in their lives, and being responsive to their needs. Interestingly enough, while Synagogue 3000 envisioned the relational approach targeting young Jewish adults, the Next Dor communities are discovering it works with everyone. Is your synagogue willing to form relationships with people who might not become members? Is your rabbi really willing to “be known” by synagogue members? What are your biggest obstacles to moving from a program-based community to relationship-based? Relationships, it’s all about the relationships! Rabbi Aaron Spiegel is the CEO of Synagogue 3000. The report was the result of Synagogue 3000’s participation in FACT (Faith Communities Today), the largest and most comprehensive surveyor of faith communities in the United States. This post is part of a series on networks and network weaving that Darim Online is curating to advance the communal conversation about relationship focused Jewish communities. Thanks to UJA Federation of New York for supporting our research and this blog series. Click here to see other related posts in the series.